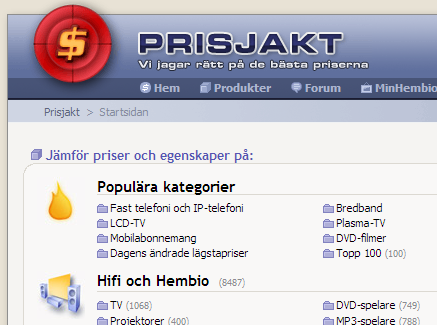 I’ve just noticed that Prisjakt.nu, a commercial Swedish website, is using -moz-border-radius to make their design look a little more 21st century. That’s the first time I’ve seen that on a major website. However, it doesn’t look like they’re using the to-be-standardized border-radius… But then again, I guess that doesn’t have any effect in any browser as of today… Or does Safari understand border-radius? The website is similar to Froogle et al. ; it compares prices from different shops for whatever product you may be interested in. Posted at 06:23. Tags: Mozilla. Categories: browsers, Mozilla Firefox. Both comments and trackbacks are closed.